Traveller, Marc Miller's definitive sci-fi tabletop game, has been bundled with classic edition adventures and starcharts for a limited time. Contrary to popular opinion, tabletop roleplaying isn't all fantasy settings and Tolkienesque races. Science fiction is also a big part of the medium, thanks in large part to Marc Miller's gaming opus Traveller. Originally published in 1977, Traveller quickly became the definitive space-based tabletop game, letting players explore its massive predefined universe or discover new planets using a world generation system. Even with multiple editions carrying the Traveller brand, all versions remain popular, and new players can start from the beginning with Bundle of Holding's Classic Traveller PDF collection. 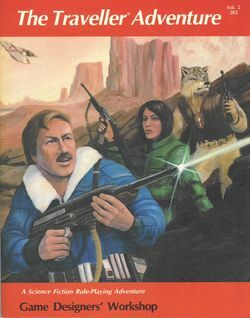 The basic bundle kicks off with The Traveller Book, a 1982 compilation of the original 1977 game books. Gamemasters will also get Traveller Supplement 12, a collection of forms, charts, and map grids that can be copied for use during play. The FASA Deck Play Set ACS-1 provides ten starting ships, including scouts, corvettes, and a private yacht, that can be printed as full-size poster maps. Finally, Bundle of Holding has compiled a Traveller orientation pack with starting guides, an extensive timeline, and errata. For paying above the average, Bundle of Holding will also throw in an introductory adventure, two campaign books, and an Atlas of the Imperium with 35 starmaps. Even without the world generation rules, these books contain enough content to fuel months of ongoing play. If the prospect of dropping characters in an expanding universe excites you, or you just appreciate the 1970s sci-fi aesthetic, this set should be up your alley.